Three years ago, U.S. Navy Seals led a raid into Abbottabad, Pakistan, which resulted in the death of the most infamous terrorist of our lifetime, Osama bin Laden. His death was met with more relief than happiness among the American public at the time, but it’s also worth remembering that, prior to his killing, confidence in the mastermind of the September 11, 2001, terrorist attacks had slipped among Muslims in many of the countries we surveyed. The Pew Research Center has been polling on issues of extremism in majority-Muslim nations for many years. Support for al Qaeda, the terrorist organization that bin Laden founded, was low among the Muslim publics surveyed when we first asked the question in 2010, and remained low in 2013, two years after bin Laden’s ignominious end. In our 2013 poll, a median of only 13% among Muslims across the 11-countries surveyed had a favorable view of al Qaeda, while 57% had an unfavorable opinion of the terrorist group. The highest support was in the Palestinian territories, where 35% of Muslims had a favorable view of al Qaeda. But elsewhere, less than a quarter of Muslims held a positive opinion of the extremist organization. 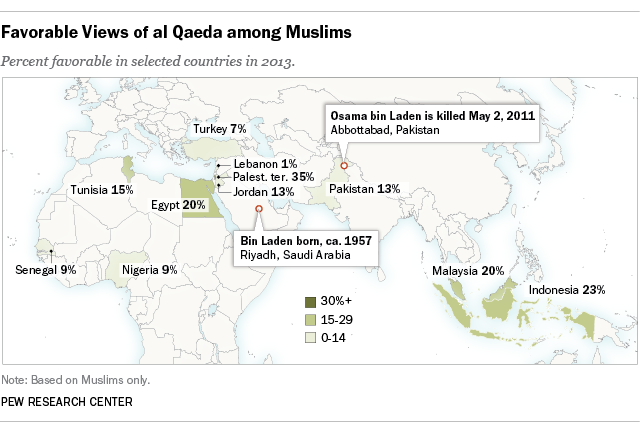 Support was lowest in Lebanon, where only 1% of Muslims had a favorable impression of al Qaeda. Support for al Qaeda among Muslims plummeted most dramatically in Nigeria, by 40 percentage points, during the 2010 to 2013 time period, probably as a result of increased terrorist activity by al Qaeda-linked Boko Haram. In Jordan, it fell by 21 points among Muslims during the same time period. In addition to low support among Muslim publics for the al Qaeda organization, support for one of its common tactics, suicide bombing, is generally rejected among Muslims surveyed. Only 3% of Muslims in Pakistan, where bin Laden was living for most of the years after the 9/11 attacks, said suicide bombing was often or sometimes justified to defend Islam from its enemies. And less than two-in-ten Muslims said this in Indonesia (6%), Nigeria (8%), Jordan (12%), Tunisia (12%), Turkey (16%) and Senegal (18%). However, as of last year, substantial minorities of Muslims in Lebanon (33%) and Egypt (25%) said that suicide bombing is an acceptable tactic in defense of Islam. And in the Palestinian territories, 62% of Muslims said this.